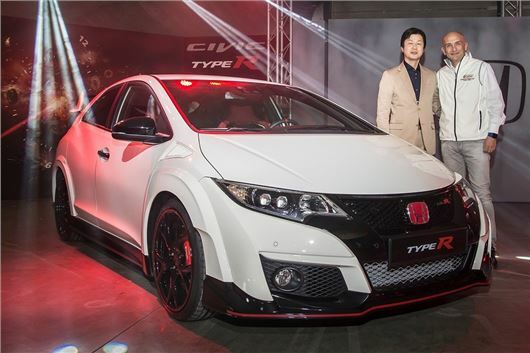 Honda has announced that the new Civic Type R will get a turbocharged four-cylinder engine producing 310PS – more than any other Civic Type R and more than most other hot hatches. Performance looks like that of a 90s supercar – 0-62mph takes 5.7 seconds and top speed is 167mph. It is priced at £29,995 in entry-level spec. Previously Honda has used its VTEC system in Type -R models, which gives plenty of peak power at high RPMs, but relatively little torque low down the rev range. This isn’t the case with the new model, which produces a meaty 400Nm from as little as 2500rpm. 310PS is a lot of power to send through the front wheels, but Honda has used high quality components including Brembo brakes and adaptive dampers, plus a ‘Dual Axis Strut’ system designed to reduce torque steer. It remains to be seen just how well the car will cope with its prodigious power output, though. The massive wing is designed to produce plenty of downforce without too much drag – though it does look less distinctive than it did on the original concept car. The Civic Type-R is offered in a choice of five colours and, for those who want a bit of extra gadgetry, there is a £2300 GT Pack which adds red headlight embellishers and red exterior trim details, plus handy equipment including a Garmin navigation system, a beefier stereo, advanced safety gizmos, automatic lights and automatic wipers.